With an election call expected within the next few weeks, or days, Alberta’s political parties are continuing to nominate candidates to run for the upcoming vote. As of this afternoon, the United Conservative Party has nominated 83 candidates in 87 districts, the New Democratic Party has nominated 80 candidates, the Alberta Party has nominated 73 candidates, the Liberal Party has nominated 35 candidates, the Green Party has nominated 19 candidates, the Freedom Conservative Party has nominated 15 candidates, and the Alberta Advantage Party has nominated 11 candidates. 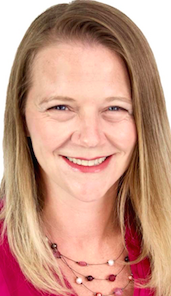 The New Democratic Party are expected to nominated Heather Eddy in Calgary-South East and Paula Cackett in West Yellowhead on March 16 and Shannon Dunfield in Grande Prairie-Wapiti on March 17. 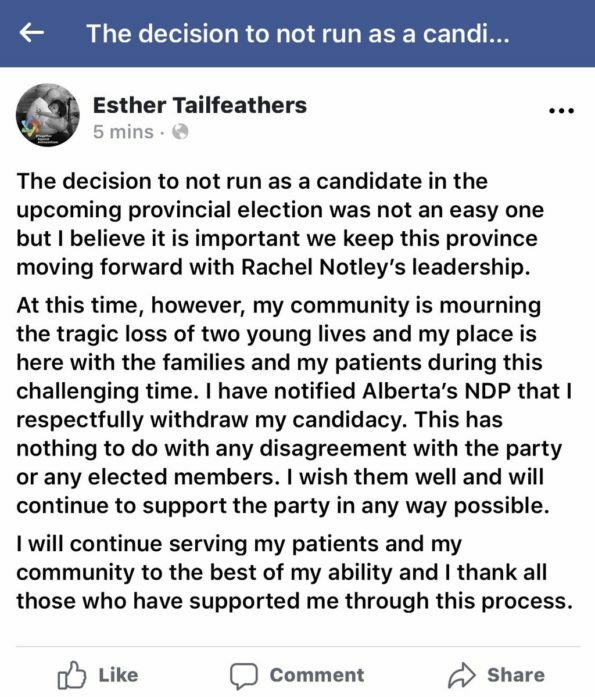 Dr. Esther Tailfeathers has withdrawn as the New Democratic Party candidate in Cardston-Siksika. In a post on Facebook, Dr. Tailfeathers described her reason for withdrawing from the race. The NDP have scheduled a new nomination meeting in Cardston-Siksika on March 18, 2019 and a candidate nomination meeting in Vermilion-Lloydminster-Wainwright on March 16, 2019. 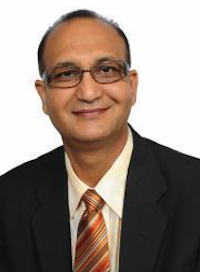 Avinash Khangura has been nominated as the Alberta Party candidate in Calgary-McCall. Khangura was the Liberal Party candidate in this district in the 2015 election, where he earned 17.4 per cent of the vote. 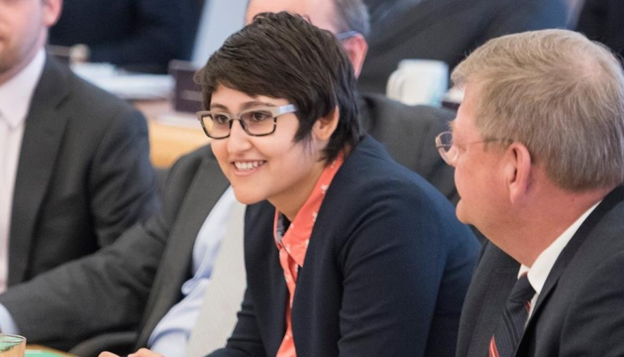 Khangura is also listed as the Riding Chair for the federal Liberal Party in Calgary-Skyview district, which is currently represented by former Liberal and now Independent Member of Parliament Darshan Kang, who represented Calgary-McCall as a Liberal MLA from 2008 to 2015. The district is currently represented by New Democratic Party MLA Irfan Sabir. Daniel Ejumabone has withdrawn from the Liberal Party nomination in Calgary-West and is now running in Calgary-Bow, and Ben Midgely is the new candidate in Calgary-West. The Liberals have also nominated John Roggeveen in Calgary-Fish Creek, Prerna Mahtani in Calgary-North West, Michael McGowan in Edmonton-Ellerslie, Inderjeet Randhawa in Edmonton-Riverview, Sharon Howe in Chestermere-Strathmore, Anwar Kamaran in Cypress-Medicine Hat. Tanya Herbert is running for the Green Party in Edmonton-Gold Bar and past city council candidate Taz Bouchier is running in Edmonton-Highands-Norwood. The Freedom Conservative Party has nominated Kari Pomerlau in Calgary-Foothills and Matthew Chapin in Red Deer-North. Chapin had previously announced his intentions to seek the UCP nominations in Red Deer-North and Red Deer-South but withdrew from both races. He ran for the PC nomination in Red Deer-North in 2015 and has run for Red Deer City Council numerous times over the past decade. Shawn Tylke has been nominated as the Alberta Advantage Party candidate in Lacombe-Ponoka. Eight additional candidates affiliated with the Alberta Independence Party have registered as Independent candidates in the upcoming election: Timothy Shanks in Edmonton-North West, Roberta McDonald in Calgary-North West, Vincent Loyer in Edmonton-Gold Bar, Dave Bjorkman in Edmonton-West Henday, Don Dubitz in Camrose, Mark Grinder in Fort McMurray-Lac La Biche, Michael Keller in Fort McMurray-Wood Buffalo, and Michael Neufeld in Red Deer-North. This entry was posted in Alberta Politics and tagged Alberta Advantage Party, Alberta Election 2019, Alberta Election Candidate Nominations, Alberta Liberal Party, Alberta NDP, Alberta Party, Anwar Kamaran, Avinash Khangura, Ben Midgely, Calgary-Bow, Calgary-Fish Creek, Calgary-Foothills, Calgary-McCall, Calgary-North West, Calgary-Skyview, Calgary-South East, Calgary-West, Camrose, Candidate nominations, Cardston-Siksika, Chestermere-Strathmore, Cypress-Medicine Hat, Daniel Ejumabone, Darshan Kang, Dave Bjorkman, Don Dubitz, Edmonton-Ellerslie, Edmonton-Gold Bar, Edmonton-Highlands-Norwood, Edmonton-North West, Edmonton-Riverview, Edmonton-West Henday, Esther Tailfeathers, Fort McMurray-Lac La Biche, Fort McMurray-Wood Buffalo, Freedom Conservative Party, Grande Prairie-Wapiti, Heather Eddy, Inderjeet Randhawa, Irfan Sabir, John Roggeveen, Kari Pomerleau, Lacombe-Ponoka, Mark Grinder, Matthew Chapin, Michael Keller, Michael McGowan, Michael Neufeld, Paula Cackett, Prerna Mahtani, Red Deer-North, Red Deer-South, Roberta McDonald, Shannon Duffield, Sharon Howe, Shawn Tylke, Tanya Herbert, Taz Bouchier, Timothy Shanks, United Conservative Party, Vermilion-Lloydminster-Wainwright, Vincent Loyer, West Yellowhead on March 14, 2019 by Dave Cournoyer. 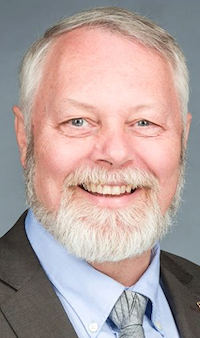 Former Green Party leader, Wildrose Party MLA, Independent MLA, and Progressive Conservative nomination candidate Joe Anglin has been nominated as the Alberta Party candidate inRimbey-Rocky Mountain House-Sundre months after he publicly mused about running for Derek Fildebrandt’s populist Freedom Conservative Party. A relentless and fearless advocate with a reputation for being a lone-wolf, Anglin is one of the more colourful characters to have graced Alberta politics over the past decade. 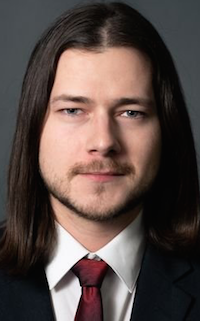 Anglin was elected as MLA Rimbey-Rocky Mountain House-Sundre in the 2012 election and first served as a Wildrose Party MLA and then as an Independent MLA until his defeat in the 2015 election. 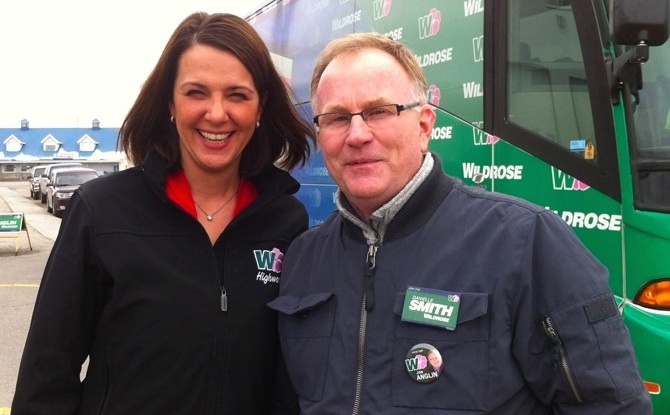 Wildrose leader Danielle Smith with Joe Angiln during the 2012 Alberta Election. Anglin lost the Wildrose Party nomination to Jason Nixon in 2014 and left the Wildrose Caucus shortly afterward. He attempted to mount a campaign for the PC Party nomination in the district in early 2015 but was denied entry into the race. He then ran as an Independent and earned 11.3 per cent of the vote in the 2015 election. With service in the United States Marine Corps, the Canadian Coast Guard, and a New Hampshire police service under this belt, Anglin burst on to the political stage in the mid-2000s, leading the Lavesta Area Group in a landowners revolt against the construction of giant electrical transmission lines through rural central Alberta and soon after took over the leadership of the Alberta Greens. 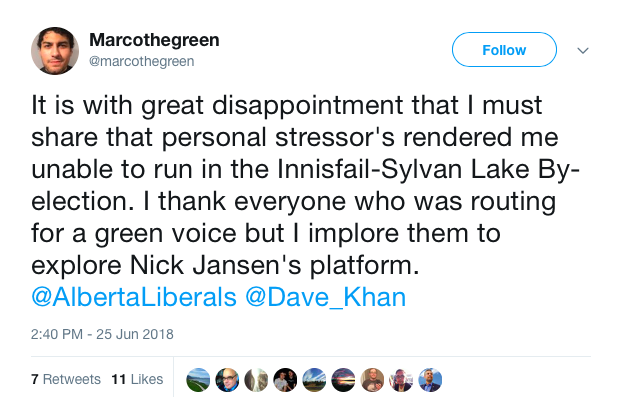 He earned the best result ever for a provincial Green candidate in Alberta in 2008, when he earned 22 per cent of the vote in Lacombe-Ponoka. He left the Greens soon after the election as the party dissolved. He won a seat on Rimbey Town Council and was rumoured to be considering numerous political options, including a potential jump to the then-renewed Alberta Party, but ended up joining the Wildrose Party instead. Anglin has been on a legal crusade over the past few years as he pursued lawsuits against Alberta’s Chief Electoral Officer and Elections Alberta, alleging abuse of process and challenging financial penalties. Most recently, he asked the RCMP to investigate Nixon for alleged obstruction of justice. His nomination as a candidate for the Alberta Party is a surprising because of his previous statements about the Freedom Conservative Party, but not surprising because of his history of party-hopping. His return to the world of electoral politics will undoubtably bring a level of entertainment value that will make this race worth watching in the upcoming election. Anglin will face Alberta Advantage Party candidate Paula Lamoureux, Green Party candidate Jane Drummond, New Democratic Party candidate Jeff Ible and United Conservative Party candidate Jason Nixon. The NDP have nominated Melissa Langmaid in Chestermere-Strathmore. And Kyle Johnston is seeking the NDP nomination in Olds-Didsbury-Three Hills. Johnston is the former president of the Red Deer & District Labour Council and a member of United Steel Workers Local 1944 Unit 205. The Alberta Party has nominated Vincent Rain in Lesser Slave Lake. The Liberal Party has nominated Steve Cochan as its candidate in Edmonton-Gold Bar and Ryan Campbell in Calgary-Varsity. 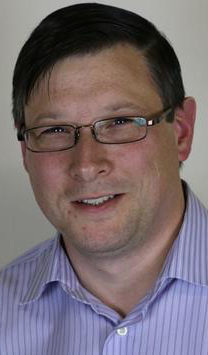 The Green Party has nominated Stuart Andrews as its candidate in Edmonton-Strathcona. Alberta Advantage Party leader Marilyn Burns will run as a candidate in Edmonton-South West. 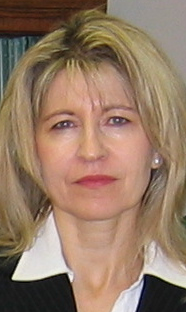 The Freedom Conservative Party has nominated Regina Shakirova in Calgary-Bow and Wesley Caldwell in Camrose. Eight more candidates affiliated with the Alberta Independence Party have filed their papers to run as Independent candidates:: Buster Malcolm in Athabasca-Barrhead-Westlock, Thomas Manasek in Calgary-Fish Creek, Richard Fontaine in Calgary-South East, Christopher McAndrews in Calgary-Varsity, Terris Kolybaba in Edmonton-Manning, Dallas Price in Edmonton-Mill Woods, Dan Irving in Highwood, John McCanna in Lethbridge-East, and Vern Sparks in Livingstone-Macleod. Six members of the Livingstone-Macleod UCP Constituency Association Board of Directors have walked away from the Board and the Party in recent days. “Board President Maureen Moncrieff says, for her, this has been coming for a while. She says she’s been growing disillusioned with the Party, and in particular Leader Jason Kenney, who she says promised a grass roots party, but has shown it to be anything but. This entry was posted in Alberta Politics and tagged Alberta Advantage Party, Alberta Election 2019, Alberta NDP, Alberta Party, Athabasca-Barrhead-Westlock, Buster Malcolm, Calgary-Bow, Calgary-Fish Creek, Calgary-South East, Calgary-Varsity, Camrose, Chestermere-Strathmore, Christopher McAndrews, Dallas Price, Dan Irving, Danielle Smith, Derek Fildebrandt, Edmonton-Gold Bar, Edmonton-Manning, Edmonton-Mill Woods, Edmonton-South West, Edmonton-Strathcona, Freedom Conservative Party, Green Party of Alberta, Highwood, Jane Drummond, Jason Kenney, Jason Nixon, Jeff Ible, Joe Anglin, John McCanna, Kyle Johnston, Lavesta Area Group, Lesser Slave Lake, Lethbridge-East, Livingstone-Macleod, Marilyn Burns, Maureen Moncrieff, Melissa Langmaid, Olds-Didsbury-Three Hills, Paula Lamoureux, Regina Shakirova, Richard Fontaine, Rimbey-Rocky Mountain House-Sundre, Ryan Campbell, Steve Cochan, Stuart Andrews, Terris Kolybaba, Thomas Manasek, United Conservative Party, Vern Sparks, Vincent Rain, Wesley Caldwell on March 9, 2019 by Dave Cournoyer. Photo: Women in Alberta Politics: Shannon Phillips, Cheryle Chagnon-Greyeyes, Rachel Notley, Leela Aheer, and Sarah Hoffman. In honour of International Women’s Day, today’s candidate update focuses specifically on the total number of women nominated to run for Alberta’s political parties in the upcoming provincial election. Women make up the majority of our population, but they rarely come even close to being the majority in electoral politics. The only woman leading a major political party in Alberta is Premier Rachel Notley of the New Democratic Party. 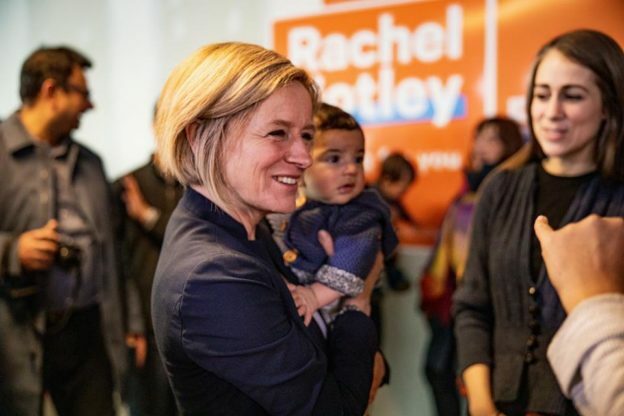 Notley is also currently the longest serving woman in the Assembly, having been first elected as the MLA for Edmonton-Strathcona in 2008, and re-elected in 2012 and 2015. The second longest serving woman MLA currently in the Legislature is Sandra Jansen, who was elected as MLA for Calgary-North West in 2012. Green Party leader Cheryle Chagnon-Greyeyes is the first Indigenous woman to lead a political party in Alberta. She has been nominated as her party’s candidate in Calgary-Varsity. Marilyn Burns leads the Alberta Advantage Party. And Naomi Rankin has the distinction of being both the first and longest serving woman leader of a registered political party in Alberta. Rankin has led the Communist Party of Alberta since 1992. There are currently 29 MLAs who identify as women serving in the Alberta Legislature (33%), up from the previous record of 23 women MLAs (27%) in 1998. Forty-eight per cent of NDP MLAs elected in 2015 were women, and, in 2016, the majority of Alberta cabinet ministers were women. The NDP has nominated the most women candidates of the political parties contesting the 2019 election with 42 women (53%) out of 79 candidates already nominated to stand in the upcoming election. In 2015, the NDP nominated 45 women (51%) in their slate of 87 candidates. The United Conservative Party has nominated 27 women (32%) out of the 83 candidates already nominated to run in the next election as of today. The UCP’s predecessor parties, the Progressive Conservative Party nominated 21 women candidates (24%) and the Wildrose Party nominated 16 women candidates (18%) in 2015. The Alberta Party has nominated 22 women (30%) in their slate of 71 candidates nominated as of today. And the Liberal Party, with 26 candidates currently nominated, has nominated 10 women candidates (38%). Eight of the 17 candidates currently nominated by the Green Party are women (47%). The Freedom Conservative Party slate of 11 candidates includes no women, and the Alberta Advantage Party has nominated 1 woman candidate out of 9 nominated candidates as of today. This entry was posted in Alberta Politics and tagged Alberta Advantage Party, Alberta Election 2019, Alberta Election Candidate Nominations, Alberta Liberal Party, Alberta NDP, Alberta Party, Alberta PC Party, Calgary-North West, Calgary-Varsity, Cheryle Chagnon-Greyeyes, Communist Party of Alberta, Edmonton-Strathcona, Freedom Conservative Party, International Women's Day, Leela Aheer, Marilyn Burns, Naomi Rankin, Rachel Notley, Sandra Jansen, Sarah Hoffman, Shannon Phillips, United Conservative Party, Wildrose Party, Women in Alberta Politics on March 8, 2019 by Dave Cournoyer. Photo: Appointed UCP candidate Len Rhodes and UCP leader Jason Kenney (source: YouTube). The fallout from Jason Kenney’s decision to appoint former Edmonton Eskimos President and CEO Len Rhodes as the United Conservative Party candidate in Edmonton-Meadows continues. 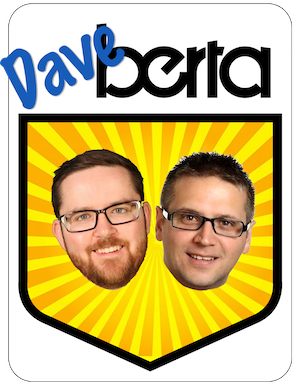 As mentioned in the latest episode of the Daveberta Podcast, some members of the local UCP board of directors are up in arms about Kenney’s claim that they were consulted with and asked for Rhodes to be appointed as the candidate. Some of the disgruntled board members are said to be collecting signatures for a letter disputing Kenney’s claims, and that more than a dozen local directors have signed the letter. 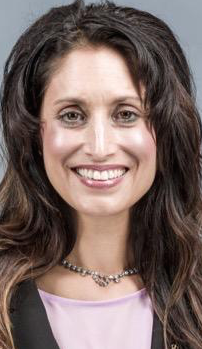 Rhodes’ surprise appointment last week eliminated three candidates – Arundeep Sandhu, Joel Mullen and Sant Sharma – who had been selling party memberships and door-knocking to compete for the UCP nomination for up to twelve months. Arundeep Sandhu released a letter on social media today expressing his disappointment in the decision and thanking his supporters. It was a classy letter, but it certainly did not include the “let’s all get behind the appointed candidate” message that Kenney and Rhodes were likely looking for. Meanwhile, more than 400 New Democratic Party members voted to choose Jasvir Deol as their candidate in Edmonton-Meadows. Deol defeated Chand Gul and MLA Denise Woollard, who had been elected to represent Edmonton-Mill Creek in 2015. Deol was the NDP candidate in the 2015 federal election in the Edmonton-Mill Woods district, where he earned 12.7 per cent of the vote in the contest against Liberal Amarjeet Sohi and Conservative Tim Uppal. Woollard is the third NDP MLA to be challenged and defeated in a nomination contest. MLA Trevor Horne was defeated by MLA Marie Renaud in St. Albert and Jordan Stein defeated MLA Anam Kazim in Calgary-Glenmore. 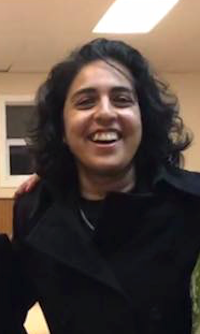 Peace River NDP MLA Debbie Jabbour is facing a nomination challenge from Justin Sharpe at a meeting scheduled to take place on February 28, 2019. MD of Ranchlands Reeve Cameron Gardner has been nominated as the NDP candidate in Livingstone-Macleod. 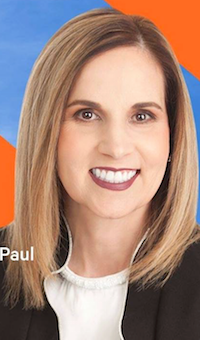 Former Taber town councillor and past president of the Alberta Library Trustees Association Laura Ross-Giroux has been nominated as the NDP candidate in the southern Alberta district of Taber-Warner. Crown prosecutor Moira Vane is the NDP candidate in Strathcona-Sherwood Park. An NDP nomination meeting in West Yellowhead that was originally scheduled for this past weekend appears to have been rescheduled to March 9, 2019. 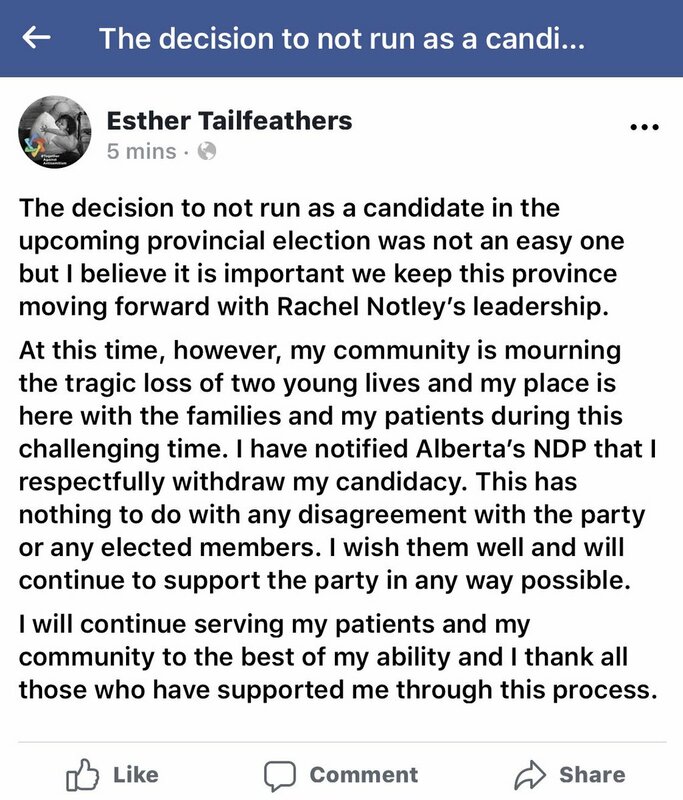 Dr. Esther Tailfeathers is seeking the NDP nomination in Cardston-Siksika. Dr. Tailfeathers is a Physician at the Blood Tribe Clinic at Standoff and a Clinical Lecturer in the Faculty of Medicine and Dentistry at the University of Alberta. Melissa Langmaid has announced plans to seek the NDP nomination in Chestermere-Strathmore. Langmaid is an Environmental Advisor with AltaLink and a unit coordinator with the United Utility Workers’ Association. 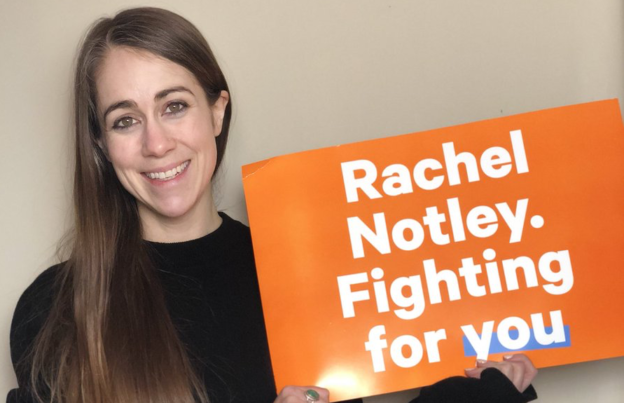 Holly Heffernan is seeking the NDP nomination in Drumheller-Stettler. Heffernan is a retired Registered Nurse and long-time NDP activist, having run numerous times for the NDP in both provincial and federal elections in Calgary. The elusive mystery star candidate is nowhere to be seen, but the UCP has moved ahead with the party’s nomination vote in Red Deer-South anyway. Party members will choose from the Bruce Buruma, Gary Davidson, Adele Poratto, Jason Stephan, and Norman Wiebe on March 16, 2019. Buruma is Director of Community Relations for Red Deer Public School District and Executive Director of the Foundation for Red Deer Public Schools. Davidson is Chief of Emergency Medicine for Alberta Health Services’ Central Zone. Poratto is a decorator and event planner, and ran for the PC Party nomination in the district ahead of the 2008 election. Stephan is a lawyer and president of the Red Deer Taxpayers’ Association. And Wiebe was the Wildrose Party candidate in this district in the 2015 election, earning 24 percent of the vote behind NDP candidate Barb Miller and PC candidate Darcy Mykytyshyn. 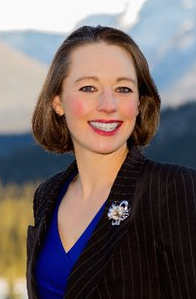 Davidson’s wife, Pamela Davidson, sought the UCP Central Alberta Director election at the party’s 2018 annual general meeting and previously ran against Christine Moore in the Red Deer County Division 6 election in 2017. Moore ran unsuccessfully for the UCP nomination in Innisfail-Sylvan Lake ahead of the 2018 by-election and as the Progressive Conservative candidate in Red Deer-North in the 2015 election. The UCP has also opened nomination contests in Edmonton-Ellerslie, Edmonton-Highlands-Norwood, and Edmonton-MIll Woods. Former UCP MLA Rick Strankman has announced his plans to run for re-election as an Independent candidate in Drumheller-Stettler. 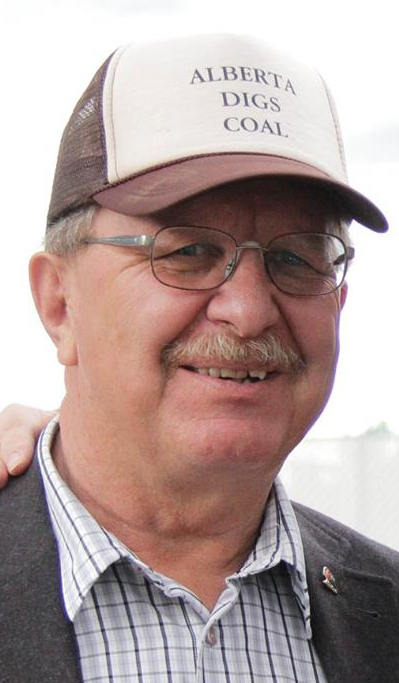 Strankman was elected as a Wildrose MLA in 2012 and 2015 and left the UCP caucus on January 15, 2019 following his loss of the party’s nomination to rancher Nate Horner in October 2018. 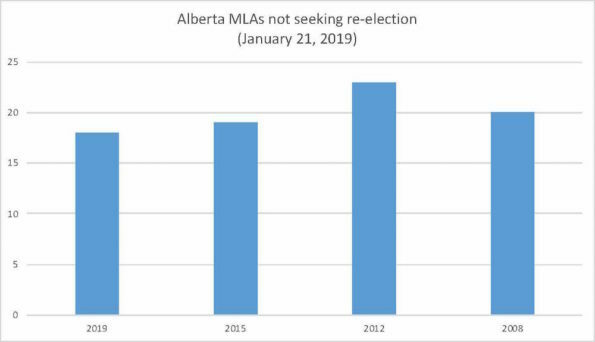 “After nearly seven years as an MLA shackled with Party-first priorities, it is clear that Alberta’s party system of government has stripped effective representation and across-the-board best interests from Alberta’s citizens,” wrote Strankman in a media release posted on this website. “Running for election and winning office as an Independent will enable me to restore the priorities of all Drumheller Stettler citizens to the front lines of the Legislature and advance their priorities for resurrecting Alberta’s prosperity.” he said. Former MLA Ian Donovan is running as an Independent in the new Cardston-Siksika district. Donovan was first elected as a Wildrose MLA in Little Bow in 2012 and crossed the floor to the PC Party in 2014. He was narrowly defeated in the 2015 election, finishing 12 votes behind Wildrose candidate David Schneider. 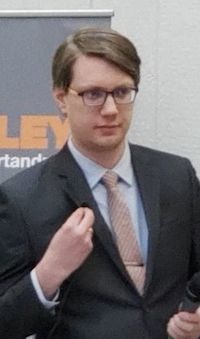 With Schneider declining to seek re-election, Donovan supported past Christian Heritage candidate Marc Slingerland in the UCP nomination contest against eventual winner Joseph Schow. Donovan later announced he was quitting the UCP, citing a dictatorship-like control of the party by Kenney. The Court of Queen’s Bench has waived the 5-year ban on Alberta Party candidates Moe Rahall in Edmonton-Castle Downs and Diana Ly in Edmonton-Gold Bar, who will now be allowed to run in the 2019 election. Party leader Stephen Mandel and four other Alberta Party candidates still await their fate as the court has yet to remove their bans. Janice Fraser is running for the Green Party in Calgary-McCall. Fraser is currently the office manager for Calgary-Mountain View Liberal MLA David Swann, who is retiring after four-terms in the Legislature. 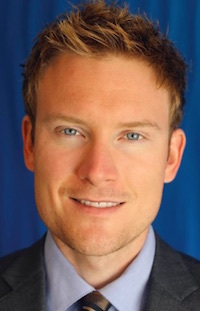 Swann’s other constituency office staffer, Joshua Codd, is the nominated Liberal Party candidate in Calgary-Currie. Jane Drummond is running for the Green Party in Rimbey-Rocky Mountain House-Sundre. Drummond is the editor of the Nordegg Squeek and has served as an Alberta Hiking Association member representing Terra Firma Nordegg Hiking. Meanwhile, Chris Glassford has been nominated as the Alberta Advantage Party candidate in Sherwood Park and Mark Gregor has been nominated in Drayton Valley-Devon. This entry was posted in Alberta Politics and tagged Adele Poratto, Alberta Advantage Party, Alberta Election 2019, Alberta Election Candidate Nominations, Alberta NDP, Alberta Party, Alberta PC Party, Amarjeet Sohi, Anam Kazim, Arundeep Sandhu, Barb Miller, Bruce Buruma, Calgary-Currie, Calgary-Glenmore, Calgary-McCall, Calgary-Mountain View, Cameron Gardner, Candidate nominations, Cardston-Siksika, Chand Gul, Chestermere-Strathmore, Chris Glassford, Christine Moore, Darcy Mykytyshyn, David Schneider, David Swann, Debbie Jabbour, Denise Woollard, Diana Ly, Drayton Valley-Devon, Drumheller-Stettler, Edmonton Eskimos, Edmonton-Castle Downs, Edmonton-Ellerslie, Edmonton-Gold Bar, Edmonton-Highlands-Norwood, Edmonton-Meadows, Edmonton-Mill Woods, Esther Tailfeathers, Gary Davidson, Green Party of Alberta, Holly Heffernan, Ian Donovan, Innisfail-Sylvan Lake, Jane Drummond, Janice Fraser, Jason Kenney, Jason Stephan, Jasvir Deol, Joel Mullen, Jordan Stein, Joseph Schow, Joshua Codd, Justin Sharpe, Laura Ross-Giroux, Len Rhodes, Little Bow, Livingstone-Macleod, Marc Slingerland, Marie Renaud, Mark Gregor, Melissa Langmaid, Moe Rahall, Moira Vane, Nate Horner, Norman Wiebe, Pamela Davidson, Peace River, Red Deer-North, Red Deer-South, Rick Strankman, Rimbey-Rocky Mountain House-Sundre, Sant Sharma, Sherwood Park, St. Albert, Stephen Mandel, Strathcona-Sherwood Park, Taber-Warner, Tim Uppal, Trevor Horne, United Conservative Party, United Utility Workers’ Association, West Yellowhead, Wildrose Party on February 25, 2019 by Dave Cournoyer. Stephen Mandel wins Alberta Party leadership. Alberta Advantage Party acclaims Marilyn Burns as leader. 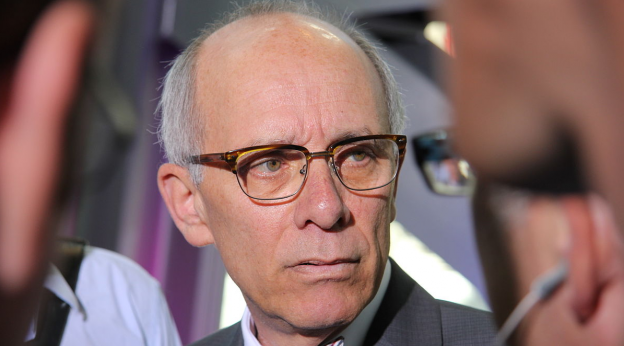 Former Edmonton mayor Stephen Mandel, 72, is the new leader of the Alberta Party. 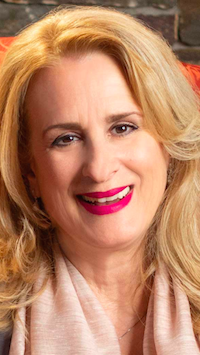 Mandel was elected on the first ballot with 66 percent of the vote, defeating Calgary lawyer Kara Levis, who placed second with 18 percent, and Calgary-South East MLA Rick Fraser, who placed third with 16 percent. 4,613 of the party’s 6,443 members participated in the vote. Mandel served as mayor of Edmonton from 2004 to 2013 and as a city councillor from 2001 to 2004. He represented the Edmonton-Whitemud district as a Progressive Conservative MLA from 2014 to 2015 and was Minister of Health until his defeat in 2015 to New Democrat Dr. Bob Turner. He has said he will run in the next election in the Edmonton-McClung district, currently represented by New Democratic Party MLA Lorne Dach. The Alberta Party currently has three Calgary MLAs in the 87 MLA Legislative Assembly. It is widely rumoured that lone-PC MLA Richard Starke could cross the floor to join the Alberta Party caucus this spring. Starke was endorsed by Mandel in last year’s PC Party leadership race. While the Alberta Party has framed itself as a “centrist” alternative to the two main political parties in the province – the NDP and the UCP – the party’s policies reveal it to be a conservative party in a similar vein as the old PC Party. Meanwhile, much further to the fringe populist right, Edmonton lawyer Marilyn Burns has been acclaimed as leader of the anti-UCP Alberta Advantage Party. A co-founder of the Wildrose Party and vocal critic of the UCP, Burns was the only candidate in the race. She was a candidate for the leadership of the Alberta Alliance Party in 2005 and was a candidate for that party in Stony Plain in the 2004 election. The party is in the process of registering but is not yet recognized as an official party by Elections Alberta. This entry was posted in Alberta Politics and tagged Alberta Advantage Party, Alberta NDP, Alberta Party, Alberta Party Leadership Race 2018, Bob Turner, Calgary-South East, Edmonton-McClung, Edmonton-Whitemud, Kara Levis, Lorne Dach, Marilyn Burns, Richard Starke, Rick Fraser, Stephen Mandel, United Conservative Party, Wildrose Alliance Party on February 27, 2018 by Dave Cournoyer. Derek Fildebrandt and Don MacIntyre out of the UCP caucus. Alberta Advantage Party picks a new leader on Feb. 24, 2018. Derek Fildebrandt is out of the United Conservative Party Caucus for good, according to a statement issued by party leader Jason Kenney last week. Fildebrandt pleaded guilty in a Didsbury court house last week to illegally shooting a deer on private property and he was fined $3,000. The former official opposition finance critic was a rising star in Conservative partisan circles until his political career crashed in August 2017 when he was forced to leave the UCP Caucus after a series of embarrassing scandals. Fildebrandt arrived in Alberta in 2012 to work as a Canadian Taxpayers Federation spokesperson and he was elected to the Legislative Assembly as the Wildrose Party MLA for Strathmore-Brooks in 2015. As an Independent MLA for Strathmore-Brooks, Fildebrandt now must decide what is next for his political career. A significant redistribution of the electoral boundaries divides his current district into the new Brooks-Medicine Hat, Chestermere-Strathmore and Olds-Didsbury-Three Hills districts. If he had been allow to rejoin the UCP caucus, he would have faced an uphill battle to win the nomination against popular incumbent Leela Aheer, who currently represents Chestermere-Rockyview and has declared her intentions to seek the UCP nomination in Chesteremere-Strathmore. Olds-Didsbury-Three Hills is currently represented by UCP MLA Nathan Cooper, who is also expected to seek re-election. Also departing the UCP caucus last Friday afternoon was Innisfail-Sylvan Lake MLA Don MacIntyre, who announced on Twitter that he was “Resigning from politics today to focus on our family.” Mainstream media outlets published a flurry of reports explaining the reason for the MLA’s unexpected departure soon after his announcement, but those stories were quickly removed. I expect we will learn more about the nature of MacIntyre’s departure soon. It was also unclear whether MacIntyre, a member of his party’s Rural Crime Task Force and one of his caucus’ fiercest climate change deniers, has just resigned from the UCP Caucus or whether he has also resigned as the MLA for Innisfail-Sylvan Lake. If he has resigned as MLA, a by-election would required to be called in this heavily conservative voting rural central Alberta district by August 2018. Penhold town councillor and local constituency association co-president Mike Walsh has already registered his intentions to seek the Innisfail-Sylvan Lake UCP nomination for the expected 2019 general election. They are not even officially registered as a political party, but members of the group calling themselves the Alberta Advantage Party are electing their first permanent leader on Feb. 24, 2018. Information on the party’s website is vague, but posts on their Facebook page suggest that Marilyn Burns, a co-founder of the Wildrose Party and critic of the UCP, is the only candidate in the race. Burns was a candidate for the leadership of the Alberta Alliance Party in 2005 and was a candidate for that party in Stony Plain in the 2004 election. 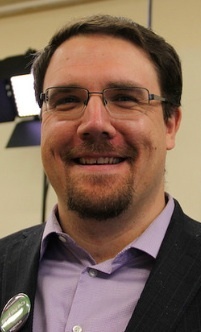 Gil Poitras, who served as Chief Financial Officer for the Alberta Party in 2013 and 2014, has been serving as interim leader of the Alberta Advantage Party. This entry was posted in Alberta Politics and tagged Alberta Advantage Party, Alberta Advantage Political Party Association, Alberta Alliance Party, Alberta Party, Chestermere-Strathmore, Derek Fildebrandt, Don MacIntyre, Gil Poitras, Innisfail-Sylvan Lake, Innisfail-Sylvan Lake by-election, Jason Kenney, Leela Aheer, Marilyn Burns, Mike Walsh, Nathan Cooper, Olds-Didsbury-Three Hills, Strathmore-Brooks, UCP Rural Crime Task Force, United Conservative Party on February 5, 2018 by Dave Cournoyer.